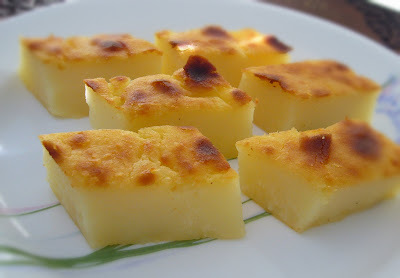 We (Northerner)... called it bengkang while the Southerner called it bingka.. There are 2 types of tapioca, white flesh and yellow flesh. The white flesh is softer... often used for fritters, or boil until tender and eat it with grated fresh coconut mix with sugar or with palm sugar syrup and coconut milk. The yellow flesh tapioca is a little bit bitter to taste and harder... but it make excellent bengkang or bingka. The bengkang will have a rough texture and slight 'bitter' taste. Grease a 20cm x20cm baking tray with butter.Mix all the ingredients in a mixing bowl and blend together with a hand whisk or blender. Pour into the tray. Bake at 180C for 40 minutes. Turn up the grill and grill the kuih for 5 to 10 minutes or until the top is brown or aromatic. Leave it to cool before cutting.